Flat turnips are the distinctive broad, flat-topped roots of the turnip plant. They are disk-like in shape and are around 10 to 12 centimeters in diameter. Flat turnips have a smooth skin that, depending on the variety, may be creamy white or golden yellow in color. When white varieties are exposed to the sun, they may develop a purple crown. The flesh of the Flat turnip is fine-grained and succulent, with a crisp bite. Flat turnips have a mild flavor, and are sweet when they are young, becoming more bitter as they mature. If the climate is hot and dry, they can develop a strong mustard-like flavor. Flat turnips are available year-round, with a peak season in the summer and fall months. Flat turnips are botanically classified as Brassicaceae rapa, and are related to cabbage, Brussels Sprouts, cauliflower, radish and kohlrabi. 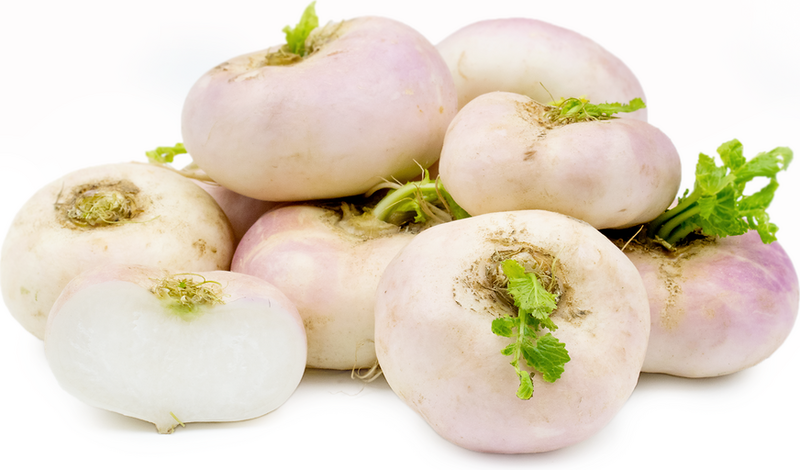 Varieties of Flat turnip include Milan Purple Top turnips, Petrovyskaya turnips and Early White Flat turnips. Flat turnips are an heirloom cultivar that have been a popular item in seed catalogues since the 1800s. Flat turnips contain vitamins A, B, C and E, as well as folic acid, calcium, zinc, copper, fiber and manganese. They contain glucosinolates, which can help with liver health and may be effective in preventing tumor growth. Flat turnips have anti-inflammatory benefits and contain antioxidants that have been studied for their ability to fight free radicals in the body. Flat turnips can be used in raw and cooked preparations, and it is suggested that they be peeled to reduce bitterness. They can be sliced and chopped and used in soups and stews, or grated and eaten raw in salads and coleslaws. In the Mediterranean, Flat turnips are commonly sliced and eaten raw with a little olive oil, vinegar, pepper and salt. Flat turnips can be roasted, boiled or mashed, pairing well with olive oils or butter. Complementary herb pairings include thyme, tarragon, fennel and chives. Fresh turnips can be stored whole in a plastic bag in the refrigerator crisper for 1 to 2 weeks. Flat turnips can be stored in the freezer for several months, but must first be cooked to prevent enzyme breakdown. Peel, chop, and blanch quickly before storing in a freezer-safe container. In North America, the Flat turnip was first cultivated in the 1600s by settlers, and widely eaten throughout the 1800s. At that time, seed growers would advertise Flat turnip seeds along with lima beans, carrots and cabbages, as they were considered ideal crops for the kitchen garden. Turnips in general have a history of being poor man’s food, and in ancient Roman times, they were commonly thrown at unpopular public figures. Turnips are believed to have originated in Asia, and were later brought to ancient Greece and Rome. Records suggest that Roman colonists were growing Flat turnips throughout Europe around the 1st Century. Flat turnips prefer temperate climates, and unlike other turnip varieties, they can be harvested within just 30 days of planting.